Winning a UFC title is an incredible accomplishment at any age, but being the youngest to ever do it is a special claim all its own. Currently that mantle belongs to light heavyweight champion Jon Jones, who, in a previous reign, captured the gold at 23 years and eight months old by defeating Mauricio “Shogun” Rua at UFC 128. 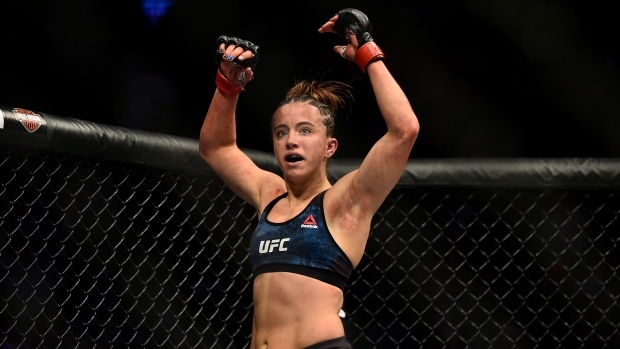 Undefeated UFC strawweight Maycee Barber not only has her eyes on the prize, she wants to break the record as the youngest to achieve the feat. Barber is moving up to flyweight on Saturday to face JJ Aldrich, who will just happen to have current 115 lbs. champion Rose Namajunas in her corner. This is not the first time Barber will compete with the strawweight champion’s eyes on her. It's the TSN MMA Show EXTRA! There is so much going on in the world of MMA that we needed another show. Interviews with Ariel Helwani on all of the biggest news topics, Pedro Munhoz makes his case for an immediate title shot for the vacated bantamweight belt, Maycee Barber on her plot to become the UFC's youngest champion, Aljamain Sterling on why he feels that he is next in line for a shot at the bantamweight title rather than Henry Cejudo or Pedro Munhoz and Devin Clark discusses his advocacy for Down Syndrome awareness on World Down Syndrome Day. With Barber still a few fights away from challenging for the title, there is no guarantee that Namajunas will still be at the top of the division when she comes calling, though the 20-year-old thinks the odds are good that it will either be the current champion or Ultimate Fighter 23 winner Tatiana Suarez that she’ll have to dethrone to achieve her goal. With her eye on the strawweight title, Barber is planning to contest her next few fights in the flyweight division. She also plans to remain active after Saturday. “As long as I stay healthy, I don’t really spend much time out of the gym,” said Barber. “I would like to fight International Fight Week (UFC 239), I’ve mapped it out and I have a planner. I’ve mapped out 14 weeks away from this fight. I’ve mapped out 14 weeks away from that fight and then again in 14 more weeks. As for which fighters will be across the cage from the Colorado native, she doesn’t have anyone specific in mind. “The UFC is going to give me who they are going to give me. It’s hard to tell them,” said Barber. “When they offer you an opponent, they’re not offering it to you because they’re just throwing a person out there. They have a reason behind why they’re giving you someone. UFC president Dana White said in a recent interview that Barber is one of the prospects he’s excited for and that she hits him up all the time over text. The 20-year-old says her messages to him are not much different than what she tells the world.